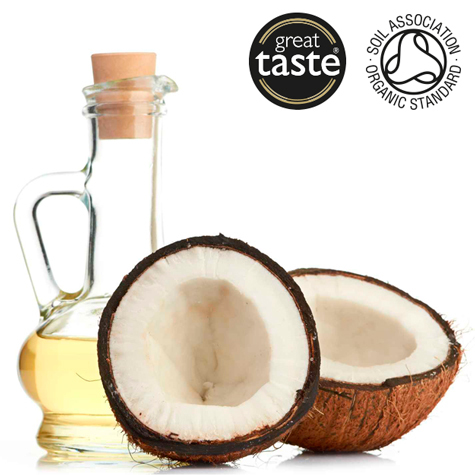 The Certified Virgin Coconut Oil from Cocofina is produced from carefully selected coconuts, without added ingredients, without additives and without preservatives. VCertified Virgin Coconut Oil from Cocofina is a virgin coconut oil, cold pressed and unrefined. It is obtained from an exceptional class of coconuts originally from Kerala, carefully selected to guarantee their quality. Cocofina Certified Virgin Coconut Oil is obtained from traditional procedures, without added ingredients, without additives and without preservatives, resulting in a coconut oil with a silky texture, a delicate coconut flavor and sweet aroma. Cocofina received its first Excellence in Food and Drink Award in 2005. It exerts antiviral, fungicidal and antibacterial effects on the organism. Prevents hypertension and cardiovascular diseases. Coconut oil is a healthy and versatile fat, and can be used in both cosmetic and kitchen applications. It maintains its properties much longer than any other oil since, one of its main characteristics is that it holds extreme temperatures very well. The Coconut Oil can be heated and cooled as many times as you want without altering its characteristics, preserving at all times its properties, its aroma and its flavor. Its conservation is simple, it can be stored in the refrigerator or at room temperature, protecting it from direct sunlight. Organic Coconut Water Cocofina is a refreshing and natural drink based on coconut water of ecological origin, without added ingredients or additives.